So this movie was huge when I was a kid. It was in every magazine and newspaper, and yet I never, ever got around to seeing it. I have no excuse. I don’t know why I didn’t, it was just one of those things. I am so happy I finally did! I found myself grinning like a fool for chunks of this movie, and yet it managed to take things back to a super serious thing effortlessly, and successfully. The era in which this movie is set suits it perfectly, too, so all the themes and messages explored within it just resonated more. I thought that the Elliot family was so sad and dysfunctional, trying to hang in there, yet fighting the big fight. Billy’s love for dancing is amazing to watch, and to see his journey, his dedication to continue with an art like ballet was fantastic. 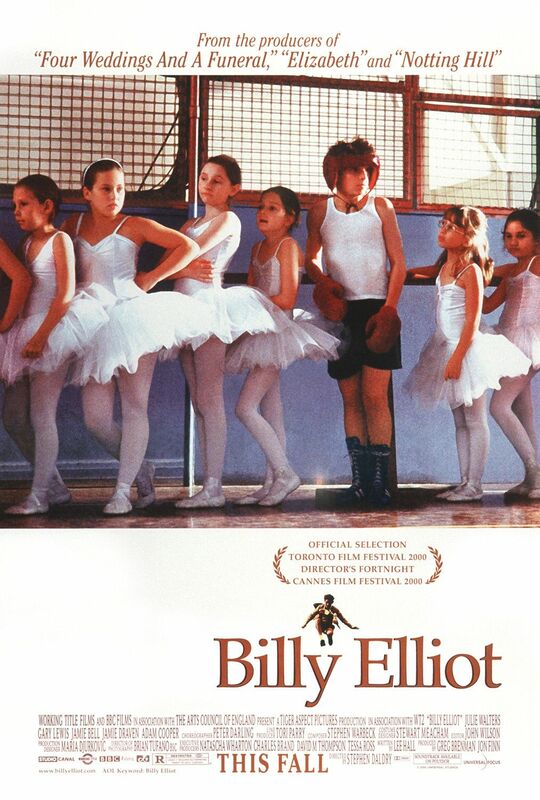 Billy Elliot is a heartwarming story and it is sweet to boot, and yes, it will also break your heart at the best of times. Jaime Bell is incredibly talented, even as a young boy this is evident. I was particularly taken with the family, and how they eventually all got behind Billy, how he became the family’s beacon of hope (when that letter arrived and that whole family was on edge and waiting). It was so sweet. I thought the soundtrack for the movie was also great, every song fit the scene, and they were all fun and fitting, which can sometimes be an issue. If you haven’t seen Billy Elliot, get to it. Now. Soon. It’s wonderful! This entry was posted in Movies and tagged Adam Cooper, ballet, Dancing, fun, Gary Lewis, heartwarming, Jamie Bell, Jamie Draven, Julie Walters, movie reviews, movies, sad. Bookmark the permalink. Great recommendation and reminder that I STILL haven’t seen this either (despite hearing so much about it). I really love the concept of the story and it does sound really fun. Oh Tom, definitely do yourself a favour then and have a look see! I enjoyed it way more than I thought I would, and I can see now why it was so loved by people. Thanks! I think you will like this! Did It check that media It uploaded? I love this one, but then again I always have a penchant for British indies, esp about the underdogs. Jaime Bell is indeed very talented, glad to see his career has gone well across the Atlantic. This really was a great little film, and I would love to see Bell in more things. Hey Zoë! Just sent you a Twitter DM, hope you’ll do it! You should definitely put it on your list! It is well worth it! LOL nooooo, nothing live Love, Actually, but definitely dreary yet uplifting xD That’s quite accurate. This was so much better than I thought it was going to be.